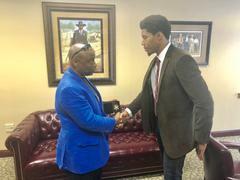 Sheriff Victor Hill Swears In Citizen As Honorary Deputy For Catching A Serial Burglar! Back in the old west, there were always a group of men and women that the Sheriff could depend on if he needed extra help with outlaws. They became referred to as the Sheriff’s Posse. Clayton County Citizen Christopher Belgrave who once served in our country’s beloved Marine Core proved himself to be the type of man that Sheriff Victor Hill would call on if he was ever short on help. Tuesday before last March 20, 2018, Joseph Skinner, a serial burglar, led Fayette County Sheriff’s Office on a high speed chase that took them through Henry County. Skinner obviously was not paying attention when he cross the line and came into Clayton County. Many criminals who have crossed into the borders of Clayton County would have warned Skinner that he was making a huge mistake. A calvary of Clayton County Deputies, PD Officers, along with the Sheriff responded to help Fayette County catch Skinner. 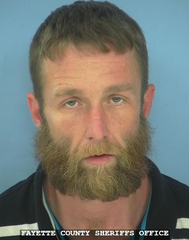 The high speed chase ended in Lovejoy where Skinner drove behind a house and fled from the Fayette County Deputies. Clayton Sheriff’s Deputies and PD Officers set up a perimeter bringing out tracking dogs to help Fayette County. By the time the Sheriff arrived on scene to lead the manhunt, he was pleasantly surprised to find out that Skinner had just been captured. This time, not by his Deputies. Skinner fled and hid in Christopher Belgrave’s garage. When Mrs. Belgrave walked out to her car, she was startled to find a stranger in her garage. Mrs. Belgrave ran back into her home screaming for her husband as Skinner followed her and tried to pull her door open behind her to enter the home. Mr. Belgrave open the door that his wife had locked and pointed his gun at Skinner letting him know he better not go any further. Mr. Belgrave then held Skinner at gunpoint until Sheriff Victor Hill’s Deputies and PD Officers arrive to take Skinner into custody. Skinner was turned over to Fayette County so they could ship him back to the Fayette County jail. 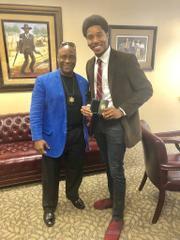 Sheriff Victor Hill was so elated that he went to meet Mr. Belgrave to shake his hand, give him a challenge coin, and commend him for being a great American. The Sheriff was so impressed with this young man that on today, he swore in Christopher Belgrave as an Honorary Deputy! Don’t be surprised if we see this young man in uniform by the end of the year, if he decides to join the Sheriff’s elite team!